My go-to rush breakfast. It is so easy, and takes 5 mins the night before. Then all you need to do is add the toppings in the morning. I am constantly in a rush in the morning (because I love to sleep in) and this fits into my busy schedule. Plus, because its already in a Tupperware, I can take it to work if I am super late! These are the toppings I like, but feel free to mix it up with something different! The fruit and nut mixture is also great on hummus with vegetables (I love dual purpose items!). In a Tupperware container mix together the milk, oats and yogurt. Place in the fridge overnight. To make it vegan, try using almond milk. 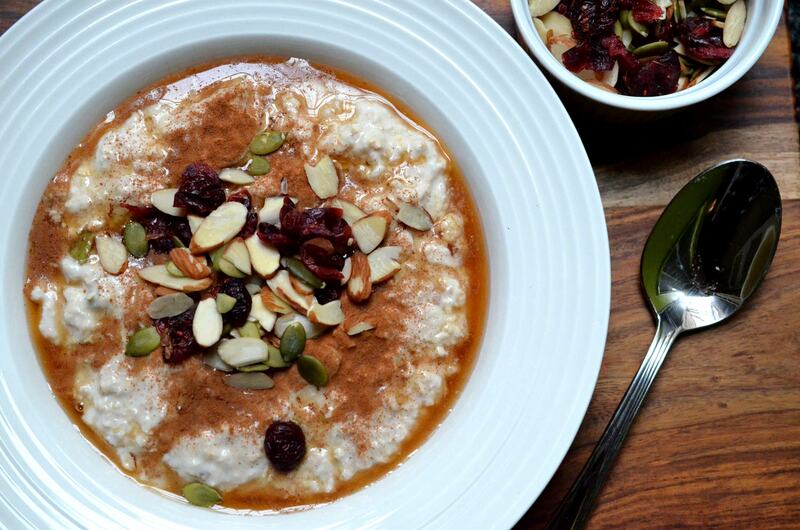 In the morning, if you wish to have warm oats, microwave them to the desired temperature. Top with cinnamon, maple syrup and fruit & nut mixture. Enjoy!